I was at our branch team’s Living Our Cause meeting this morning (see Shelly’s post below for more details- she beat me to it!). We did our Big Picture Deck activity and were asked to choose a picture to represent a relationship we had with a member and an impact we made through the relationship. I can’t pick just ONE member that I’ve impacted- or more accurately- just one relationship that has impacted both of us..and I certainly couldn’t match the feelings I was having at that moment to a picture of someone else! I may not have completed my task of sharing what I was thinking during our meeting this morning, but I’m very grateful I had the chance to stop and think today about the impact I have on others, and the impact that they’ve had on me! At the Tri-Town branch, we opened a meeting this morning with a Big Picture Deck activity. That’s not so unusual for us- we’ve been using the deck since last spring, in staff meetings, youth programs, interviews and planning sessions. But this morning we decided to dig a little deeper- the description of this activity noted that it required a “High” level of trust (and that it was a newer activity- it hadn’t been tested quite as much as some of our choices!). I wasn’t too concerned about it, because it was a small group of people who already know each other very well. We certainly have a high level of trust for each other- how challenging can a conversation be? The task this morning was to choose a picture that represented a relationship with a member and the impact that we felt we had made through that relationship. It took a little bit longer to choose a picture this morning, and we were a little less chatty while we picked- but I still wasn’t picking up on any real difference. I found a card pretty quickly and sat back to think about how I would tell my story. Then the first person shared- a story about how he had engaged some of our kids in a new activity (I can’t share details- he’ll be writing about it later!) It was pretty powerful to hear about the relationships he had built with some kids who have sometimes been a little shy in our programs. And then the next person talked about a project that she had worked on with a child in her program, that led to new friendships between some other children. And the next talked about his first days at the Y, and his getting-to-know you activities with the kids…and the stories just kept coming. There were 7 of us at the meeting, and some of the stories weren’t new to me- but hearing what the stories meant to people was amazing. When new families come to visit our programs, we are proud to tell them that what makes us “different” is our focus on character development: when kids play football at a YMCA program, they aren’t just learning about football. They’re spending time with an adult who cares about them. They’re learning how to make friends, to respect teammates (and to expect respect in return) and they’re exploring an activity that will encourage them to stay active and healthy for life. The stories around our table this morning really hammered that point home- we aren’t just TALKING about making an impact on our members, we’re really doing it! This morning’s activity pushed us to be very open with each other- I had a few tears in my eyes when I talked about a family who I’ve worked closely with since last summer. It was an unusual work experience- instead of worrying about being objective and professional, we shared some very deep, personal feelings. The goal was to feel closer and to help us strengthen our relationships with each other, and it sure felt like it worked! I won’t look at a football game or a swimming lesson the same way next time I’m visiting a program, and I’m excited to continue working with these amazing people and to hear more about their excitement and commitment to our cause. A young man named Jacob volunteers at YMCA 5 days a week. Jacob greets members, performs general office support and helps clean the wellness equipment. We are grateful for the contributions of the day to day functions of his role, but are better for all that he leaves us when the day is done. Jacob has taught members to take a minute in the flurry of their day to say hello. Jacob has demonstrated cooperation and teamwork through training. Our environment is brightened with his quick wit, warm demeanor and unwavering ability to do what’s needed! Working with Jacob has brought unique experiences and understanding that has transformed our workplace. 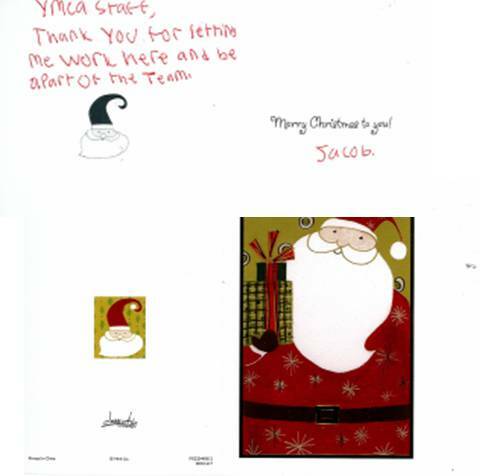 Jacob shared his holiday wishes today…We are glad to be part of his team as well! During this busy season, it’s tempting to focus all our time and energy on friends and family, leaving self-nurturing activities to fall by the wayside. We feel selfish keeping up with regular work outs, getting enough sleep or making time for relaxing. But…taking care of ourselves is really a loving gift we offer to those we are in relationship with. When we offer the very best version of ourselves to the world, it is truly a deep act of caring and compassion. The hardest part is muscling past our own self-judgment. I am mother of Mihika who is studying in Mrs. Kate McGrath’s class. I just wanted to drop you a quick note to share how happy we are to have Mrs. McGrath as Mihika’s teacher. We are amazed with the amount of projects that are happening in the …school in past six months. Mihika’s days in school are much more exciting and fun-filled than ever and her teacher gets all the credit for that. We have seen that Mrs. McGrath is very creative, be it coming up with new songs for each month, buddy bear journal or cookie tasting project. Each of the small activities have contributed something in their own unique way towards the development of the students of the class. We are also impressed with her ability to understand each child’s unique strengths and improvement areas and the passion for grooming them. Mrs. McGrath has been wonderful in sending notes every day, telling us about how Mihika’s day at school was. I just wanted to share the feedback and convey my appreciation for her excellence. Thank you so much providing such wonderful staff to YMCA preschool class. At the Indian Valley Santa event on Friday night, I had the pleasure of meeting Nicholas Andrew, who was only one week old! His parents conveyed to me that this was his “first outing”, and they wanted it to be at the YMCA! I ran into Nicholas Andrew again yesterday, as his mom sat with him while waiting for his two older siblings to finish swimming. Mom relayed that this was his “second outing”, and continued to tell me how much her family enjoys our YMCA. She went on to say that her family now spends more time together due to the YMCA! I was sure to let her know that is was OUR honor and priviledge to welcome Nicholas Andrew and the rest of his family. True Spirit of the Holiday Season! Our Child Care Director at the Indian Valley Family YMCA, Tina Gladden, reported a great story at our staff meeting today. Her Child Care staff at Rockville learned that a parent (a single mom) had nothing to give her children for Christmas due to being laid off from work. The staff quickly got together and not only provided a tree with decorations, but a few presents for under the tree! By the end of the meeting, our team had organized a toy drive and secured $50 in an anonymous donation for more gifts! I ran into the town library last night, one minute before I was supposed to be in a meeting. I heard a little voice say, “Miss Shelly!” and looked around a little anxiously- at 4:29, most of the kids I know in Wethersfield should be in an afterschool program! One of our Leaders In Training (LITs) from last summer was relaxing at a table, studying (and reading a fun-looking teen magazine). We talked for a minute about middle school and tests and teen magazines, and I apologized and said that I had to get downstairs to a meeting. I bent over to hug her good-bye, and she said, “You smell like camp.” Now, in the summer, I get to camp around 7 AM, run around ALL DAY, and head home around 6 PM. Sometimes we have competitions to see who can sweat through their camp shirts earliest- and I win a fair number of those contests! I wasn’t sure if smelling like camp was a good thing, so I asked her. She sat with her eyes closed, smiling, and said yes. We had a moment together, remembering all of the fun we had last summer- catching frogs, swimming, and making a million messy projects. Last summer was her first “messy” experience, and she loved it. She was so excited to come to camp every morning, and she always wanted a quick preview of the next day’s activities before she went home at night. Middle school can be scary, adolescence is tough, and “tweens” have a lot of complicated issues to worry about- a piece of me wishes that we could shelter them from all of the uncomfortable stuff. But I know that’s not the answer. We believe that the best thing we can do is give our kids a strong, safe “base”- our LITs spend time building relationships with each other and with positive, caring adult role models. Watching her smile about her summer experience reassured me that we had connected with her. I’m pretty happy that I smelled like camp last night! I just spoke to a volunteer that knows an employee here and he informed me that this employee works in the Health & Wellness Department and commented on the fact that they have never seen an Organization more organized and professional than ours….I know that sometimes we may feel disorganized or exhausted, but when we put in as much effort as we strive to do…it shows! Literally 10 minutes after this conversation I spoke to an employee who was working the Santa Event (Maintenance Dept.) on Friday and excitedly filled me in on the events and made sure to tell me that everyone helped cleaned up….not letting all the work fall on one Department. Last Friday night the Glastonbury Family YMCA held a Bingo night. The entrance fee to get in was a new unwrapped toy to be donated to Toys for Tots. As families started to arrive, the basket began to fill up with toys. The first basket filled very quickly and a second basket was needed. As I looked over, I realized we needed another basket. We ended up filling up three baskets full of toys to be donated. As I thought about all of these gifts, I thought about the looks on the kids faces when they opened their gifts. For some children, this may be the only gift they recieve. I had a conversation with my son about how we were donating to children who did not have a lot and he mentioned he would like to give someone his video game. It is our job as parents and role models to teach our children how to give back to those who are in need.